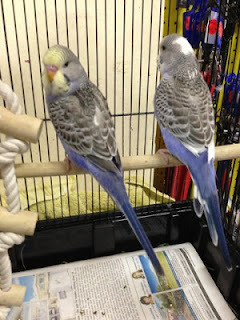 These baby budgies hatched on the 6th of May are now ready to go to a good home! They have been handled in the nest and ready to complete their training at home. We think we have a boy and a girl, although as you know only DNA testing can prove sexing at this stage. If you are interested in these budgies contact Julie on 3869 1884 or come see us in store for more information. Come see us in store 7 days a week! Pets of Sandgate 2012. Simple theme. Powered by Blogger.